Regulating Strikes in Essential Services offers a comparative perspective on one of the most sensitive areas of industrial relations: strike in essential services. Designing a fair, effective and acceptable regime that will reconcile public interest and the public’s need for an uninterrupted flow of essential services on the one hand, while maintaining the freedom of collective bargaining on the other, is an ever more difficult public policy challenge. 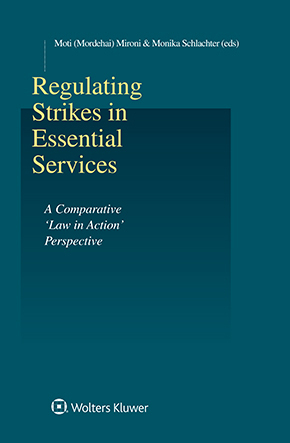 This book, the first detailed analysis of existing legal and practical approaches across a spectrum of key national jurisdictions, provides a structured and insightful overview of the law and practice of regulating strikes in essential services. As such it could be of great value for public policy debate and the enhancement of national law in the field. substantive and procedural restrictions on the right to organize, bargain collectively and strike. The country reports are preceded by a detailed analysis of the inherent normative policy dilemma and a conceptual framework for designing and evaluating models of regulation. The concluding chapter presents a comparative overview of the insights gained. With its in-depth discussion of the regulatory dilemma of protecting the fundamental right to strike for all employees while ensuring the uninterrupted flow of services, deemed as essential for the public, this book forms a refined and nuanced basis for further academic research. Its contextually relevant options for strategic choice and public policy debate makes this book an incomparable handbook for labour lawyers, legislators, policymakers, judicial bodies and researchers in the field of collective labour relations and fundamental human rights of workers on the national as well as international level.